I made some Eggless pineapple chocolate chip muffins for breakfast today with fresh pineapple juice. Breakfast plays a very important role in my day-to-day life. It even shows my mood for the day. Yes, I’m that predictable 🙂 ..If I’m in a good mood, I will make something elaborate and would love to pamper my family. If I’m in a lazy mood, I might just push through some bread toast with jam. Baking is two ways. Here’s the twist as I will bake to cheer me up from something bad or even bake something to share my joy. 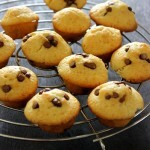 I had been in double moods today and that is when I decided to bake some muffins for breakfast. Now coming onto today’s recipe. 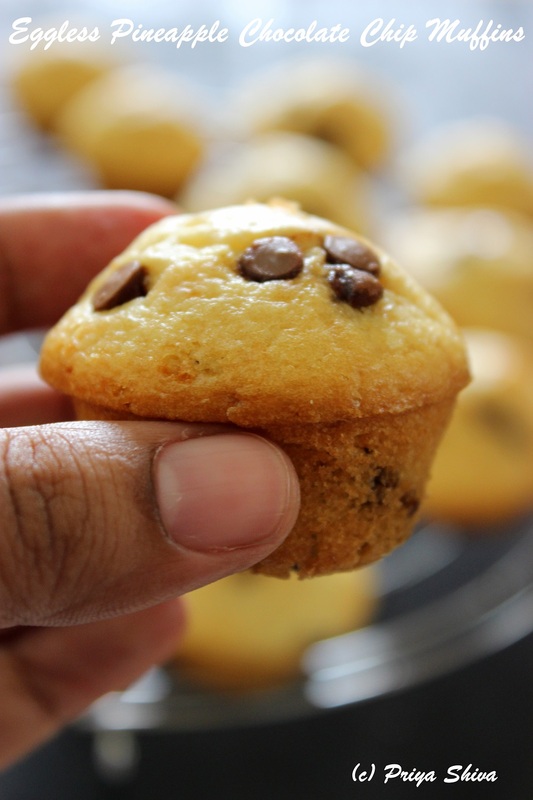 I had earlier shared some orange chocolate-chip muffins and it was a huge hit. So, I have just modified the recipe and used some fresh pineapple juice. 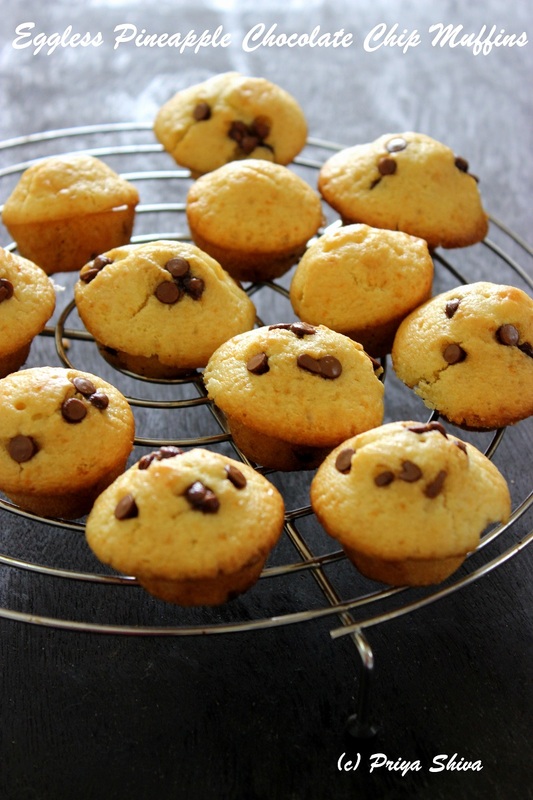 Guess what, these muffins also turned out to be delicious and loved by my family. They are light, fluffy and the best part is that they are eggless. So, sharing the recipe for eggless pineapple muffins with you all and hope you try and share the feedback with me. Now add pineapple juice, sugar, yogurt, cooking oil, vanilla essence and fold. Do not over-mix. Add chocolate chips and give a quick stir. I have used fresh pineapple juice and while making juice added 1/4 cup water. I did not add sugar while making juice. Hi priya..lovely breakfast recipe! Do link it to my healthy breakfast for kids event ..
Am an old follower of yours..thanks for sharing your lovely recipes. .voted for you in blog adda. Cheers ! cooked today,,its awesome and yummyy,,,soo soft and delicious,,just a twist given with mango pulp instead of pineapple juice. I have tried eggless muffins. It was good but it’s outer layer was slightly hard although the tase and looks were fine in all respects. May I try milk instead of juice? Hi Sunita! Thank you for trying the recipe. If the outer layer was hard, try reducing the baking time. Maybe your oven coils heat up fast and take less time to bake.. I could not find your nutritional list i.e., calories, carbs, etc.? Can I substitute APF with wholewheat flour? I have not tried with wheat flour. Wheat flour is more dense compared to APF. You can try increasing the quantity of yogurt and try it out but I cannot guarantee the softness. Thanks for sharing this beautiful recipe. I would put this my on my trying list. Love the idea of pineapple and chocolate combo. Its just great. Thanks Priya.. nice recipe! Can I make pineapple cake instead of muffins using the same recipe? This is a muffin recipe. So, the texture will vary if you try baking a cake with this recipe.